Wharariki Beach, just a few kilometers from Farewell Spit and the northern-most tip of the South Island, used to be something of a well-kept secret. Wharariki beach is located at the northern-most tip of the South Island, New Zealand. The track into the beach wanders along rolling green hills and then passes through white sand dunes. This is an amazing and naturally beautiful beach. There are a lot of caves along the beach to explore and big rock arches to confront the Wild West coast weather. However, because Wharariki can be reached only by a walk variously described as taking 15, 20 or 30 minutes it is never going to be overrun with visitors. There’s a bit of a slog up a sand hill or two as well, which might put off even a few would-be walkers. The shortest walking track into Wharariki begins with a gentle climb through pastureland dotted with sheep. It then winds through a grove of manuka before emerging on the first of several ridges of high sand hills. Although this beach is almost north-facing, it is technically a West Coast beach and is often buffeted by tempestuous winds that stir up colossal seas. The manuka provides an early-warning system – if the wind is blowing gale on the beach the forest will be alive with creaking and groaning. (Wharariki is best visited early in the day before any wind does get up. When it is windy you’ll be painfully sandblasted once you emerge from the trees). If you’re standing there watching they might also come up to you to check you out, curious and completely unafraid. Other pup lay on the rocks nearby, its dark fur providing almost perfect camouflage. Off the shore, more pups and seals sunbathed on tumbles of rock or swam in the waves. Terns and oyster catchers pottered along the shoreline. The sea is relatively warm, for an early autumn day, but this is not a beach for swimmers. Rips, currents and big seas make conditions too dangerous and there are no lifeguards here. Better to swim in the sea across the hill in Golden Bay where sometimes there is not even the smallest of waves and wading through the shallows is your most serious challenge (apart from the odd cavorting stingray). The cliffs, islands and promontories are riven with caves and clefts – it is advisable to walk into them with caution. Today, with Wharariki’s greater popularity you’re possibly more likely to encounter humans in the cave – families picnicking or couples mistakenly thinking they’ve found the perfect isolated cavern…But even with these minor perils, Wharariki is a place to explore, to follow a stream into a cave just because you can, to scramble through rock pools and to run down sand hills shoes in hand. It’s stunning in its stark rawness, the rolling dunes leading down to a vast, flat stretch of sand that extends far into the distance, to a headland that appears simply as a dark outline through the spray created by the waves. Rocky outcrops dot the shoreline, breaking through the dunes to meet the sea at high tide and leaving caves to explore at low tide. A few rocks stand alone in the water, mammoth islands of stone with arches cut through them by the pounding waves. Around this wharariki beach is also a small motel The Station House Motel which offers friendly and comfortable accommodation in Collingwood, a quiet village on the magical Golden Bay. This property is conveniently located close to beaches, cafes, stunning walking tracks, museums and Farewell Spit Tours. The Station House Motel offers self-contained studio units inside the former police station. This motel provides a range of facilities and services such as car rental and transport to the Heahpy track. Wharariki Beach! There’s no doubt that New Zealand is a country full of incredible beauty and it seems like there’s always some gorgeous new corner that we’re stumbling across. 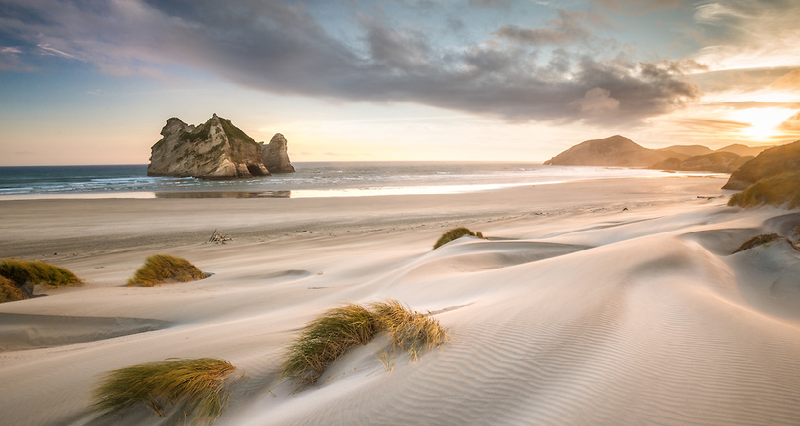 Today, we’re dreaming of escaping to this lovely beach on the northwestern coast of New Zealand’s South Island. Stroll along the white sands with the wind in your hair. Climb the sand dunes. Look for peacocks wandering about and baby seals splashing in the surf. If you plan your visit around low tide, the water creeps back so much that you can climb in and explore some of the amazing caves and rock formations. And don’t forget that you can see some truly incredible sunsets here.